Here at Minnesota Hearing Solutions, our mission is to improve the lives of our patients by providing them with exceptional hearing care. We understand that hearing loss can cause missed conversation with family and friends, missed moments with loved ones, and missed memories for all. While even one day of not hearing to your full ability is too much, years of uncorrected hearing loss can make you feel disconnected from the people around you. We work hard to repair that connection so you can go back to enjoying your life to the fullest. ​As a native of Cokato, Minnesota, Travis understands the people who live and work in the communities around him. He's excited to share his 15 years of experience in the hearing industry with his neighbors, family, and friends in the Cokato, Dassel, Howard Lake, Annandale and surrounding communities. He feels very passionate about his chosen profession and is happily helping the people of his community to live better lives through proper hearing. Travis is a 1995 Graduate of the Dassel-Cokato school district. He is now married with 11 children of his own and resides in his beloved hometown of Cokato. After 16 years in the hearing industry, we're excited to announce that the time has come to open our second Minnesota Hearing store! Our new location is at 308 5th Avenue South in Cold Spring (in the Cold Spring business center – across from the Great Blue Heron). Simonson’s equipment is portable so he’s able to offer on- site patient care as well as home visits if necessary. A treatment plan is developed after determining a patient’s hearing loss. Simonson also helps families understand hearing loss and aids them in ways to improve communication. Simonson is looking forward to serving clients in the Cold Spring area. 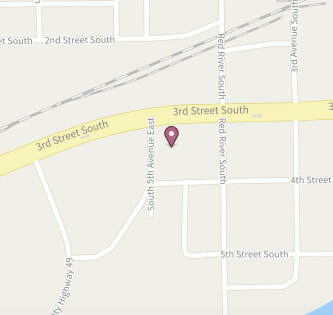 Office hours will be Tuesday and Thursday from 9:00 a.m. to 4:30 p.m. and Fridays by appointment. We're excited to begin to improve the lives of our patients in the Cold Spring area and provide them with exceptional hearing care. To book an appointment, call 320-559 0333 or book online today! COKATO, MN – Have you heard about the new hearing aid business in Cokato? 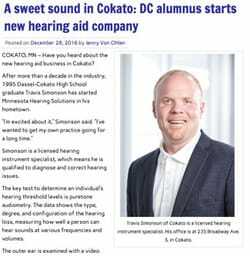 After more than a decade in the industry, 1995 Dassel-Cokato High School graduate Travis Simonson has started Minnesota Hearing Solutions in his hometown. Simonson is a licensed hearing instrument specialist, which means he is qualified to diagnose and correct hearing issues. The key test to determine an individual’s hearing threshold levels is puretone audiometry. The data shows the type, degree, and configuration of the hearing loss, measuring how well a person can hear sounds at various frequencies and volumes.The outer ear is examined with a video otoscope. Using a small camera, Simonson is able to detect issues such as fluid accumulation, eardrum damage, or excessive earwax. “My equipment is portable, so I’m able to do in-home visits if needed,” Simonson said. He also offers on-site patient care at nursing homes and other facilities.